Led by two tries apiece from wingers Max Trimble and Junior Bulumakau, Coventry boosted their Greene King IPA Championship Cup pool one qualification hopes with a 51-32 home win over Yorkshire Carnegie. A pulsating encounter saw Cov build a 25-10 advantage at the break, then pull away again in the closing stages after the visitors clawed their way back to 32-all. This leaves the blue-and-whites in second place in the table after two rounds of action, level with their Leeds-based opponents on six points. Will Maisey kicked Cov into an early lead after the home side retained possession through multiple phases inside the Carnegie 22. However, it was the visitors who claimed the first try of the afternoon through full back Chris Elder, who was left with a straightforward finish when Tom Bullough broke a tackle on halfway and carried deep into the home 22. 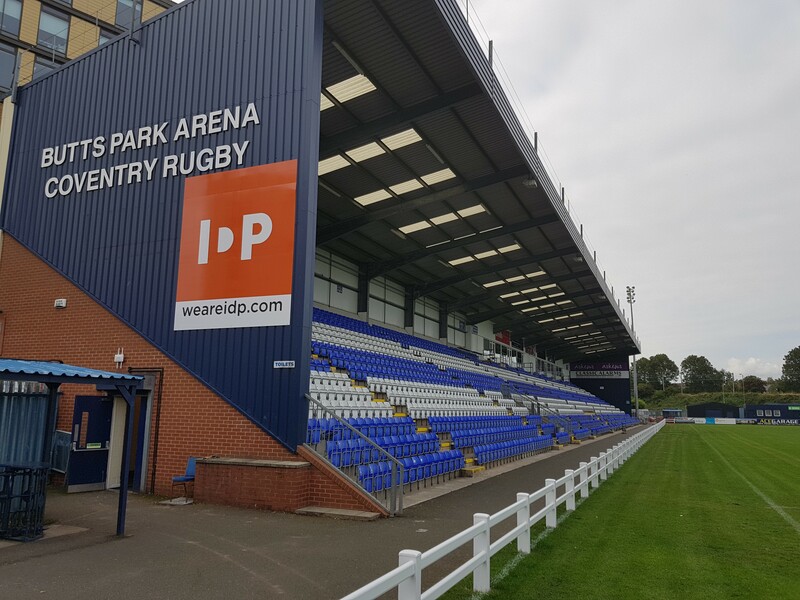 Carnegie fly half Jacob Umaga – son of former Cov head coach Mike – added the conversion, and he was also on the mark before the end of the opening quarter with a well-struck 40 metre penalty. Cov hit back with a lovely score created by a series of forward carries, continued by some slick handling and finished by Trimble who made light of limited space to wriggle into the corner from 30 metres for his fifth try of the season. Maisey’s excellent touchline conversion brought the scores level at 10-all, and the home No.10 soon put his team back in front with another cleanly-struck 25 metre kick after Carnegie were caught offside in midfield. And Coventry extended their advantage at the half-hour mark when Scott Tolmie and Bulumakau swapped passes down the right touchline to create the space from which the Fijian flyer cruised to the corner for a score which Maisey upgraded. A superb Ben Adams tackle then forced a turnover which ended a Carnegie attack deep in the home 22, and the home side took full advantage by marching play to the other end where Jack Ram, Tony Fenner and Trimble sent Rob Knox to the line. The visitors hit back early in the second half when they retained possession through multiple phases before working centre Andy Forsyth over in the corner. A strong defensive set from Cov then forced a penalty in the shadow of their own posts, after which the hosts claimed a try bonus point through another excellent long-distance score. It was launched by a driving maul which made fully 20 metres before quick hands sent Knox racing towards the corner. Although he was checked by a fine cover tackle, when Cov won quick ball replacement full back Dan Lewis sped over for a try which Maisey improved. But Carnegie were far from done, and soon claimed a third try very similar to their first-half opener, created by Forsyth’s break, finished by Elder and converted by Umaga. And the visitors were right back in the game as it entered the closing 15 minutes when they sent second row Matt Smith into the corner for their bonus-point try, brilliantly converted by Umaga. Cov then conceded two quick penalties, for foul play and offside, the second of which allowed Umaga to bring Carnegie level from 38 metres. But their come-back hopes were then extinguished when Cov’s wingers claimed a rapid try-double in as many minutes. Tom Jubb’s charge-down and out-the-back offload created the first for Bulumakau, and when Carnegie’s restart found Knox he raced 50 metres before sending the supporting Trimble racing to the posts for a try which Maisey upgraded. 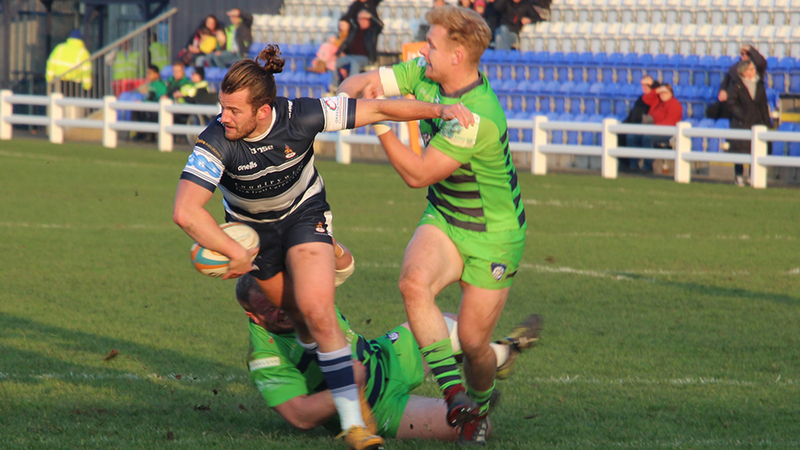 Dan Lewis’s conversion of Tony Fenner’s score – from a set move following a scrum – then took Cov past 50. James Stokes (Dan Lewis, 40); Junior Bulumakau, Rob Knox, Tony Fenner, Max Trimble; Will Maisey, Tom Kessell (Peter White, 53); James Gibbons (Nathanael Titchard-Jones, 61), Scott Tolmie (Darren Dawidiuk, 52), Biyi Alo (Phil Boulton, 48); Alex Woolford (James Voss, 63), George Oram; James Voss (Tom Jubb, 53), Jack Ram (Jack Preece, 48), Ben Adams. Chris Elder; Louis Brown, Andy Forsyth, Tom Bullough (Harry Davey, 20), Rian Hamilton; Jacob Umaga, Olly Fox (Sam Wolstenholme, 56); Marc Thomas (Tom Hill, 50), Dylan Donnellan (Joe Buckle, 56), Andrew Foster (Craig Mitchell, 64); Fa’atiga Lemalu, Matt Smith (Kieran Frost, 76); Cian Romaine, Josh Bainbridge, Antonio Kiri Kiri (Elliott Ward, 79). Posted in Match Reports, News and tagged Butts Park Arena, Championship Cup, Coventry Rugby, Yorkshire Carnegie.